Introducing a smart route to super resolution microscopy, the Olympus FV-OSR software module enables users of the FluoView FV1200 to have easy access to what was previously the domain of only specialised microscopy systems. The extra detail offered by super resolution technology facilitates researchers in revealing the most subtle mechanisms at work within cells or tissue. 3D confocal laser scanning microscopy with the FluoView FV1200 achieves a vastly improved lateral and axial resolution compared to standard widefield, but is still limited by the diffraction limit of light. In certain settings images can therefore suffer from poor contrast, even following post-acquisition processing. This is where super resolution microscopy comes into play, breaking the diffraction limit of light and enhancing cell and tissue imaging studies. Up until now, access to this technology demanded substantial investment, but Olympus is leading the charge in making this accessible and easy to use for the life science research community. Drawing from the latest optical and digital technologies, the FluoView FV1200 can now be transformed into a system capable of reaching a resolution of up to 120 nm, with simultaneous multicolour capture. The FV-OSR software controls specific hardware settings and advanced signal processing. Operation itself has been designed with the user in mind, requiring only minimal training requirements to achieve expert results. The software functions alongside the high-sensitivity GaAsP detector, with its superior signal-to-noise ratio are boosting resolution. 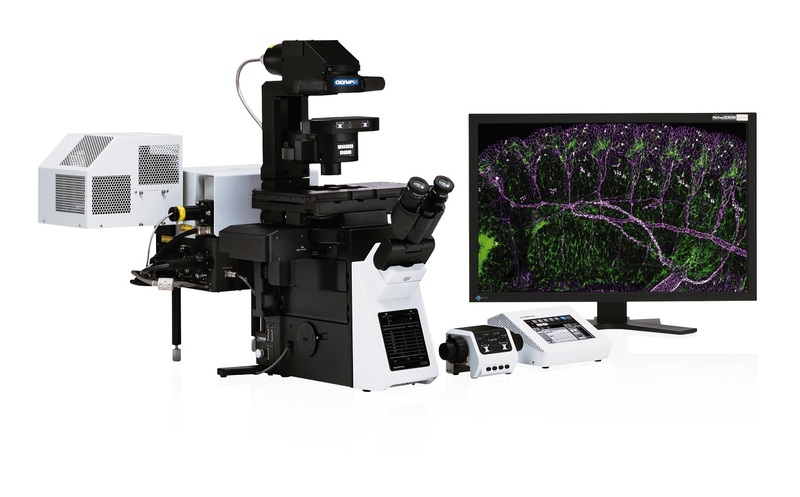 Capitalising on the flexibility of the modular IX83 automated inverted microscope platform, the FluoView FV1200 is a system optimised for a diverse array of live cell imaging applications, including FRAP, FLIP and photoactivation. Capable of up to five simultaneous fluorescent detection channels the system also includes a dedicated laser light stimulation scanner (SIM Scanner), achieving simultaneous stimulation and imaging for real-time visualisation of rapid cell responses.